Situated in Page, this motel is within 1 mi (2 km) of Powell Museum and Lake Powell. Page Hospital and Golliard Park are also within 1 mi (2 km). 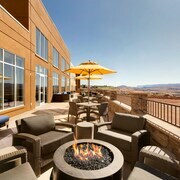 Situated in Page, this hotel is within 1 mi (2 km) of Golliard Park and Lake Powell. Powell Museum and Page Hospital are also within 1 mi (2 km). Welcoming check in & bonus room upgrade since we were staying 3 nights - balcony with view over Lake Powell. Friendly staff in all departments, great breakfast - fresh & good choices (best oats on trip :) ) great location & great value. Where to find Page hotels near an airport? Where can I find hotels in Page that are near tourist attractions? 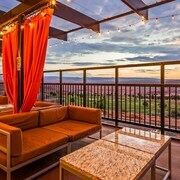 Visiting Northern Arizona and keen to book a hotel in Page? Expedia's extensive database lists 16 places to base yourself within a 0.1-kilometre (0.06-mile) radius of Page's center. 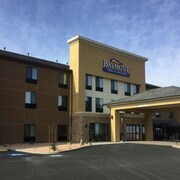 Travelers hoping to find accommodations near the heart of Page, should browse the latest offers at the Courtyard by Marriott Lake Powell and Clarion Inn. The Dreamkatchers Lake Powell Bed & Breakfast is 25 kilometres (14 miles) away from the heart of Page. Another accommodation option is the Lake Powell Resort, which is located 9 kilometres (6 miles) away. 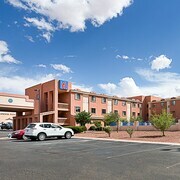 The Comfort Inn & Suites Page and the Best Western Plus At Lake Powell are alternative hotel options in Page. For those who'd like to see more of the desert landscapes, canyons and impressive rock formations in this section of United States of America, you could plan extra days in other parts of Northern Arizona. You can visit local points of interest or enjoy snowboarding and then book a suitable place to stay the night. Page Municipal Airport is situated 1 kilometre (1 mile) from Page. 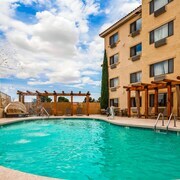 Should you wish to stay close by, can easily book a night at the Super 8 Page/Lake Powell or Knights Inn Page AZ. What are the most popular Page hotels? Are there hotels in other cities near Page? What other types of accommodations are available in Page? Explore Page with Expedia.ca’s Travel Guides to find the best flights, cars, holiday packages and more!